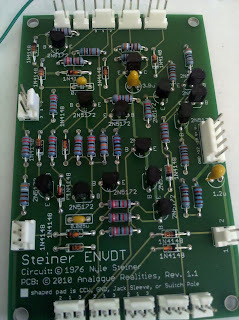 And here's the third board from the Triple EG, the ENVDT. Its envelope is a bit more complicated than the others; it has the attack/delay switch like the 2nd EG, but it is more of an Attack/Release envelope (it lacks the "Duration Level", i.e. Sustain of the others). The duration time can be controlled either by the incoming trigger's length, or a pot. 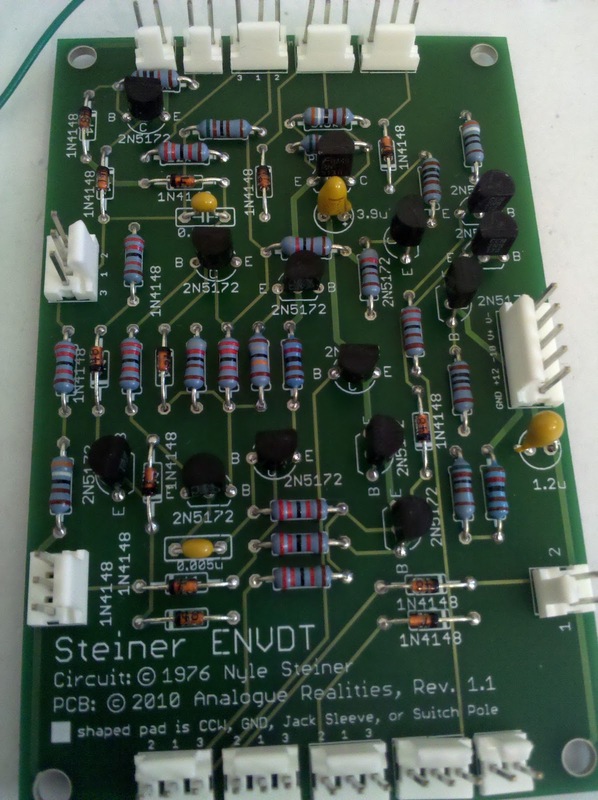 Though more complex than the ENVDL boards, it is a bit more straightforward since there's only one variant. On both this and the ENVDL boards, I've used tantalum caps in place of the impossible-to-find 1.2u and 3.9u electrolytics. Also, on this board, I went ahead and used the modified values for R22 and R28, as described in the build docs.